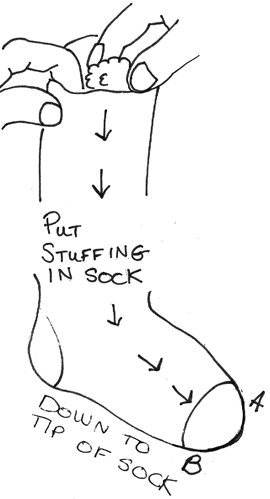 Put stuffing in your sock…all the way down to the tip of the sock. Now on side ‘A’, form a ball by making sure that some of the stuffing is at that corner and then just pushing down with your thumbs to form a ball. 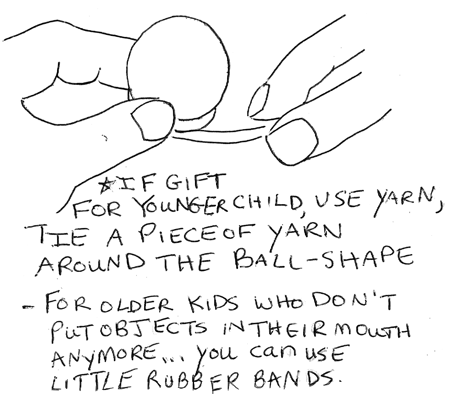 If this doll is being made for a young child (under 3 or 4 of age) you should use yarn instead of a rubber band, just in case it comes off….it could be a choking hazard. 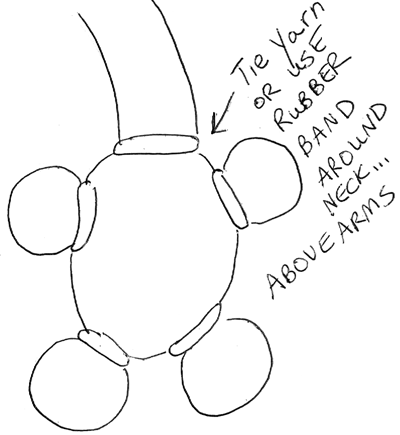 If you use a rubber band just put the rubber band around the ball until it is tight. If you are using yarn, wrap it around that ball-shape and tie knots and wrap it around more and tie more knots…then cut it off. 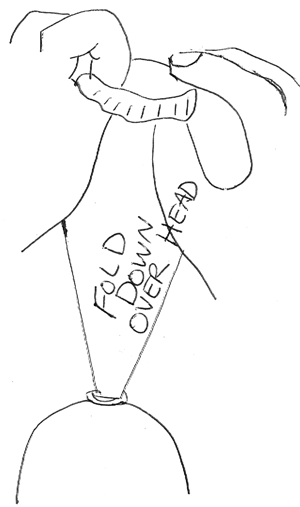 Do the same thing for the other foot, side B. 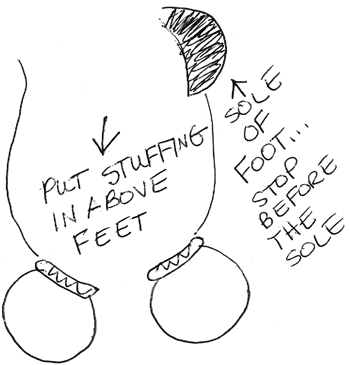 Now put stuffing above the feet for the baby doll’s belly. 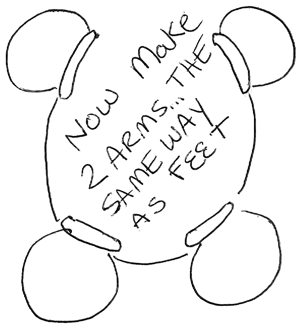 Now make 2 arms the same way that you made the feet. 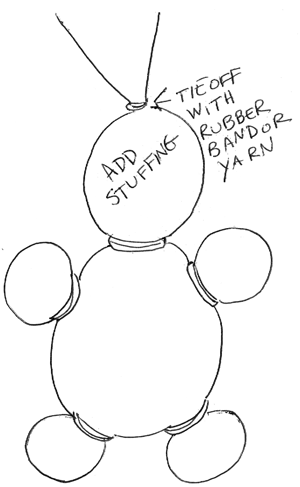 Add stuffing to the sock for the doll’s head and then again, tie off with rubber band or yarn. 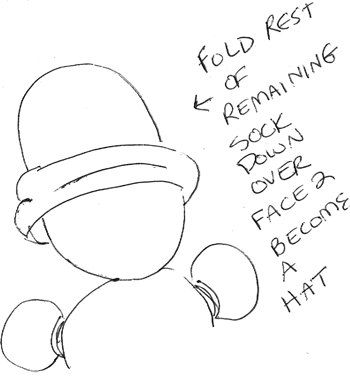 Now there is extra sock above the head….fold it down over the head to form a hat for the doll. This is what is should look like…another pic is below. This is what the doll looks like so far. Otherwise, you can sew dolls eyes, use fabric paint or sharpie, permanent markers. If you have any other ideas for eyes, please let me know. This is what your doll will look like. He is super cute. And my 4 year old loves this baby doll. She was playing with him for quite a long time and talking to him and feeding him, etc. So I think this craft was a hit. LOL – Yes. It is quite simple to make something very cute if you can sew it. However, I would like to say that my 2 daughters were in love with the sock doll…they love the little baby hat and both are still smitten with the 2 dolls. So it is up to a persons taste whether they think it is cute or not. The directions for the no sew doll is so detailed!!! The one I made for a friend made. me jelouse and so I wanr one too. anyone could make a no sew doll, even a baby. They are so cute!!!!!!!! Thanks very much for such a brillant idea!!! I am going to make this with my 3 years old kids in our week of learning gingerbread man!!! I know they will love their gingerbread man doll a lot!! 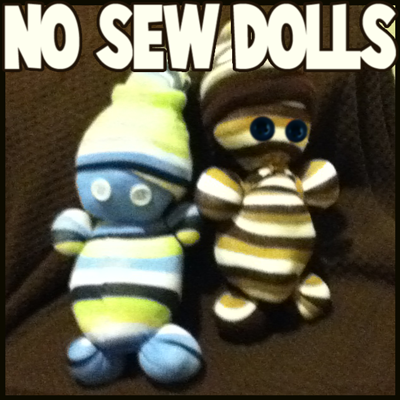 We love these dolls me and one of the kids I watch we made these and loved them!thanks for the idea!!!!!!!!!!!! this doll is so cute……try it out is fun. 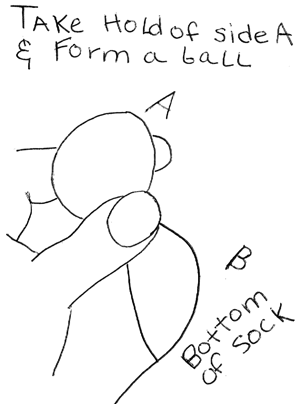 what do you do with the heel part of the sock? Since you will be stuffing the doll up to the heel of the sock…the arms will be made from the stuffing underneath the heel. 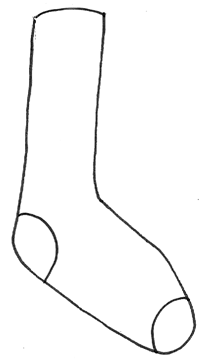 Then the heel will be under the rubber band or yarn of the neck being made in step #8. You won’t see the heel sticking out at all, as it will be beneath the rubber band. I hope this helps. They really can be any size…but it works best if they are knee socks…but just under the knee is good too…this way there is enough fabric for the hat at the top. sooooo cute i made one for my 12 year old friend and she loved it. Yeahh I thought this was kinda hard….i just made a monster with a bow instead. Great idea! 🙂 Does anyone know of how I can make a pacifier to go with these or any sock doll? Like with a real pacifier if possible. Without being sewed. Thank you! Those are awesome! Thank you for posting a pic! I am in love w this doll! Was looking for a way to expand on Comfort Dolls that are for women survivors of abuse. I teach K at a school that is the sending school for 3 area shelters. 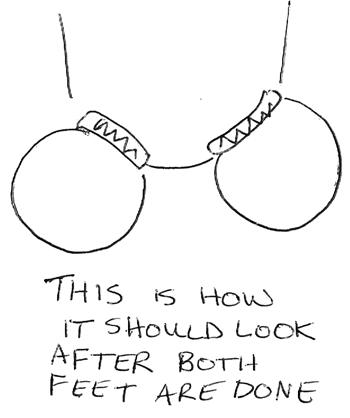 I wanted to create a small Comfort Kids doll that cud be attached by a snapping ring to homeless kids backpacks. They would have access to a tiny, tactile source of comfort on way into n out of school, in their cubby and on the school bus. They cud be removed to play with at home or shelter, or sleep with. They would arrive with a card expressing the doll being made with the love that is held within the little doll. We will turn them into lil monsters for the boys. I want to make them w my kindergarteners. A few will help me deliver them to the shelters. I think this will be a perfect Community Service introduction for my Sweet Pea’s. If its not too hard they will make another to do a secret exchange with each other for Christmas. That is an awesome idea!!! I was actually thinking of doing something similar – so excited you’re going to go ahead and do it. Good luck! HOW CUTE THESE LITTLE SOCK DOLLS. L WIL TRY TO MAKE A FEW FOR MY LITTLE GIRL OF ALMOST 2 YEARS OLD. IS THERE SOME PATERNS TO DO A LITTLE SANTA CLAUS TOO? THANKS FROM CANADA.